Jammu and Kashmir Massive anti-Pakistan protests rocked Jammu and Kashmir’s winter capital on Thursday, in the wake of the Pulwama terror attack in which at least 37 CRPF personnel lost their lives. Demonstrations and candle light marches were held at dozens of places. Braving the rains, people took to the streets in Jewel Chowk, Purani Mandi, Rehari, Janipur, Gandhinagar, Bakshi Nagar, Muthi, Talab Tilloo and Raising anti-Pakistan, anti-terrorist slogans, the protestors demanded action against Pakistan for “sponsoring terrorism in the Valley. The VHP has appealed to the central and state governments to allow the security forces to retaliate with a free hand.The Bajrang Dal said it will hold protest demonstrations all across the state on Friday.Former Minister and President of Dogra Sadar Sabha, Gulchain Singh Charak, expressed shock and grief over the gruesome killings and asked the central government to take strong action against the terrorists. The situation turned worst today followed the terror attack which claimed the lives of 49 CRPF men at Lethpora( Awantipora) in Pulwama this is so far the bloodiest ever militant attack during three decade long militancy in kashmir Valley. 49 personal of Central Reserve force (CRPF) were killed. while as some other sustained injuries after suicide attack. Reports said that a militant rammed an explosive laden vehicle into the bus of CRPF convoy at Lethpora on srinigar_Jammu National highway. 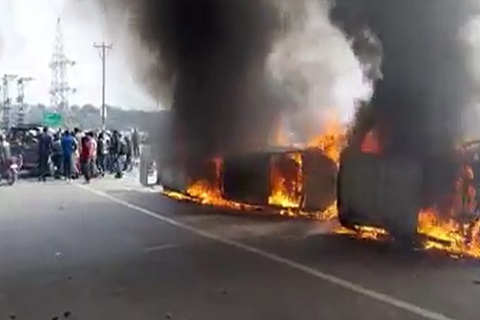 The said CRPF was the part of the 78 vehicle convoythat was heading towards Srinigar from Jammu. More than 2500 CRPF personal were moving in the CRPF convoy. The impact of the blast was such that the bus was reduced to pieces. As the convoy reached Lethioora Adil Ahmad Dar of kakapora in Southern kashmir the suicide bomber rammed into the CRPF bus into causing fatal injuries. Adil was said to be Cadre of banned militant outfit Jaish_e_Muhammad (JEM). Moreover he had in fact recorded a video in which he said that he is going to carry out a suicide attack. The video made rounds on social networking sites. The incident took place on 13 February at 3:pn and in a jiffy the bodies were seen mowed and torned into pieces on the highway. The CRPF jawans informed their higher ups about the incident and ambulances were rushed to the spot in order to evacuate the dead and injured to the hospital. The injured personnel were shifted to 92 Base Hospital at Badamibagh, Srinagar. The sound of the blast was so loud that it was heard in many areas of Srinagar falling at the fringe end of summer capital district of Jammu and kashmir India. People living in these areas were wholly horrified and though about the strong magnitude of Earth quake. came out of their houses after hearing the blast. These people thought that a strong magnitude earthquake has taken place and as such they came out fearing for their lives. Director General CRPF R R Bhatnagar said that one of the buses that was part of the convoy bore the brunt of Fidayeen attack at Lethpora. He said the convoy was moving towards Srinagar from Jammu adding that 2500 CRPF personnel were part of the convoy. Inspector General of Police, Swayam Prakash Pani said that the investigations have been ordered in the incident adding that Road Opening Party (ROP) was very much present there at the time of incident. Pani said that ROP is posted in order to ensure that the convoy passes off without any incident. “At the moment we are looking at the various angles relating to the incident. The ROP was present at the place where the incident took place. The probe will be carried out in a thorough professional manner so that the real details come out about the incident,” said the IGP. home minister Rajnath Singh arrived jammu and kashmir to to access the security situation and dealed with the top brass of security agencies. He issued directions that such suicide attacks should not take place in the future. Rajnath decided that the civilian movement will be stopped for sometime when a large convoy of security forces passes through an area. Civilians will face a little difficulty,we apologise for it. He also said that there are some elements who are hand in glove with terror organisations, terror forces & ISI across the border. They are involved in terror conspiracies too. They are toying with the future of the people, especially the youth, of J&K. There are some elements here who take money from Pakistan and ISI. I have told the officers that the security provided to such people should be reviewed.